We are instrumental in offering a high quality telescopic steel props to the customers, as per their demands on rental bases. These products can be used in all types of building construction, thus, are widely demanded in the market. Moreover, these are ideal to be used in the applications where there is a need of adjustable vertical load bearing member. Our Company is the well-known name in the market for offering the best quality Props Rental Services. Executed with the assistance of experienced employees, these props rental services are commanded in the market. While rendering these rental services, we offered only quality tested Props. We offer Props Rental Services to our clients. 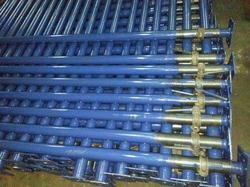 We are rendering Scaffolding Prop Rental Service. Owing to their stress-free completion and timely completion, our services are immensely admired by our patrons. In this service, we do different types of printing in proficient way. With vast experience and knowledge we are involved in offering an extensive range of Construction Prop Rentals . These are quality tested on various parameters by our quality controllers to render utmost customer satisfaction. 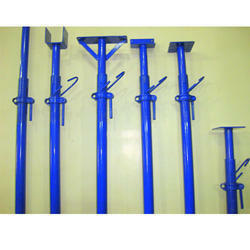 These are used in variety of application in building construction and other repairing works. Props products ensures supports to all kinds of form work, slabs, beams, wall & columns.The products also eliminate the costly labour and time consumer in cutting timber to length, wedging and nailing when used in the vertical as a prop. These are extensively used in general building construction and repair work. We are engaged in offering Telescopic Props On Rental/Props On Rental to our clients. Adjustable Telescopic Props provide the most economic method for supporting to all kinds of shuttering work and framework. Prop is a labour and time saving device to support shuttering and centering. It is Made out of 60mm O.D. & 48mm O.D.